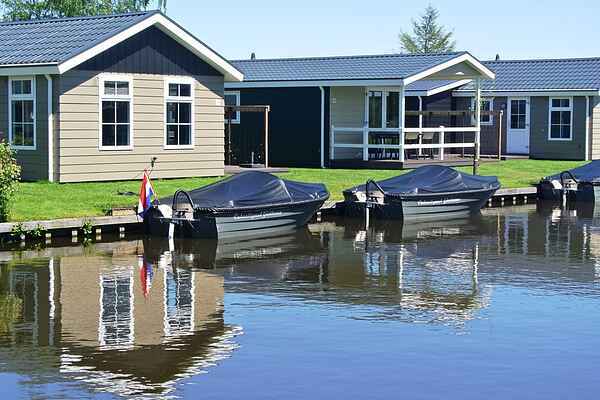 Giethoorn holiday park offers a variety of different modern accommodations. However, there is one thing they all have in common. Each is located right on the water with direct access to Het Bovenwijde lake. You can select from a variety of different accommodation types. The comfortable and fully furnished Meerkoet variant (NL-8355-11) is suitable for 4 people. The 4-person types De Rietzanger (NL-8355-10), De Reiger (NL-8355-12) and the 6-person types De Stern (NL-8355-14), De Overstern (NL-8355-26) and De Roerdomp (NL-8355-27) even come with a second bathroom. The wonderful location of NL-8355-26 certainly deserves a mention. Situated at the head of the spit, you have a marvellously vast view across Het Belterwijde. All water lodges are equipped with WiFi and a terrace/garden with garden furniture.